Watermead is one of the newer parishes in Buckinghamshire. Built as a new village, situated about half a mile north of Aylesbury in Buckinghamshire, it is also a civil parish within Aylesbury Vale district. Popular with all age groups to live, it provides a unique environment for its residents and many visitors. 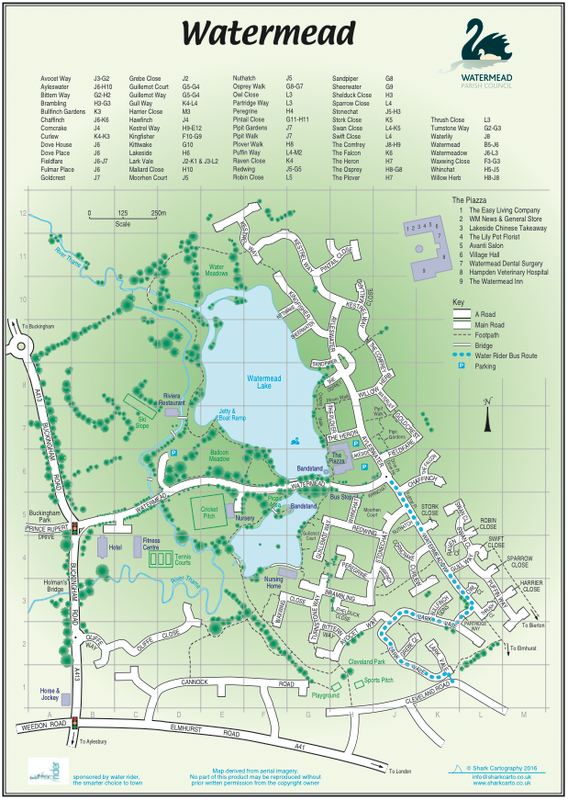 Watermead is distinctive for its lakes and extensive public amenity land, owned by the community, providing walks and places to enjoy nature which are open to the public from dawn to dusk daily. The smaller lake is managed by a fishing syndicate on behalf of the Parish Council the large lake is owned by the Riviera Restaurant and no public fishing is available. Around the lakes you will see many varieties of wildlife, flora and fauna. These areas are carefully managed and maintained and it should be noted that disturbing any wildlife, particularly birds during the nesting season is illegal. You are welcome to walk and enjoy our surroundings. However, please take notice of information boards. If you would like more information about Watermead please contact the Parish Clerk or call her on 01296 395211.